Aakash Odedra’s solo is called Murmur 2.0, and those digits in the title label it both as an upgrade (an earlier version was shown last year) and as a very techie production. For this is as much a staging of digital animation and computer effects (by Futurelab, the research unit of Austrian organisation Ars Electronica, as a dance piece created by Odedra and fellow choreographer Lewis Major. The core idea of the dance is Odedra’s own dyslexia which, he tells us, meant that he was 21 before he even noticed that his forename started with two As. Yet he begins the piece not with words but with numbers, sitting upstage and counting the beats of Indian classical dance in which he trained. When a voiceover whispers stage directions to him, he stumbles over his own legs and flips himself over, sometimes wincingly walking on his own toes – as if his body, perhaps like his eyes, cannot obey these disembodied directives. Now the digital technology takes the stage. A flock of birds swirls across gauze curtains that hang from the rigging. Odedra retreats behind them, letting the curtains screen dynamic animations that track his motion, generating fading, phosphorescent after-images, or shimmering outlines like shadows made of light. 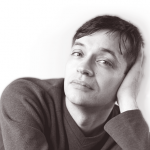 Beyond this mesmerising surface, we glimpse Odedra’s arms carving the air like wings, his fingers featherlight – a kind of cursive bodily writing, tantalisingly elusive. It’s a soaring sequence, but the piece then takes a dive. 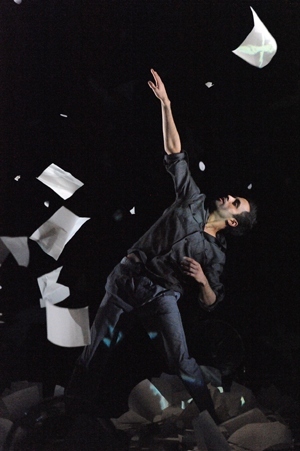 Odedra acts out a vaguely comic scene in which he tries to tidy up sheets of paper that keep falling from above, to the accompaniment of a jauntily folkish rhythm. An animation of a bird flown from its cage to be caught by a hawk is both hokey and mawkish, and the piece does not rise to meet its grand closing gesture: a ring of electric fans blowing up a blizzard of blank paper, Odedra a spinning dervish at the eye of the storm.